The last two months have given me an opportunity to not just reflect and write about Black belt responsibilities, but the whole responsibility that tests your humility, your mental restructuring, your daily attitude, your mentality as an athlete and martial artist, your grace with other students, emotional maturity, and overall the whole responsibility while pursuing the trail of the goal to BJJ Black belt. This does not come with a Black belt. This is a self charged responsibility. This originates at white belt, and evolves at the blue and purple belt levels. The brown belt is the maturation process of research, and to understand and accept your leadership roles that are growing. Or should be growing. I have got to catch up a lot with some of my coaches Masters John, Rigan and Carlos Machado lately, and have also absorbed their perspective and philosophy on many views of BJJ. The weekend of December 12, 2009 I had my quarterly in house seminar scheduled. My quarterly seminars have attendees from my academy and association academies across Texas. My coach and mentor Master Carlos Machado had taught three months ago at my academy. He and I had talked to discuss plans for 2010, and he planned to visit me in December, so I thought it would be a great treat to host him again. I was given a great surprise when one of my other coaches Master Rigan Machado happened to be visiting Carlos and a last minute surprise I found that he wanted to come visit me as well in Austin along with Carlos. We have discussed many personality types and mentalities and along those lines the goals of certain practitioners, and more importantly, goals that I myself believe in. I think this is one of those rare articles that I am making a topic that we never really hear about. I think I am going to delve a little into the discussion of the dark side, or the unfortunate types that seek to achieve belt ranking, business, fame, and finances in BJJ. I was talking to Professor John Machado on the phone recently. He told me about energy. He began to illustrate philosophically about the way energy is used and how it comes and goes. At times, we have a selfish motivation or we do something based on the wrong energy principles, and then we ususally are taken out of our good energy paths. This sounds a little mystical, but it actually makes total sense. For instance, if a burglar breaks into a bank and gets caught, usually they don’t actually admit the crime. Regarding the responsibilities of a BJJ Black belt, we develop growth, experience, maturity and so on. Most of the time in other traditional martial arts, a black belt is not an end to all. At times a black belt for instance in TKD or Karate are senior students that keep developing. In BJJ, at times over the last 10-15 years, there has always been an unfair portrayal when a student achieves blue or purple belt level. 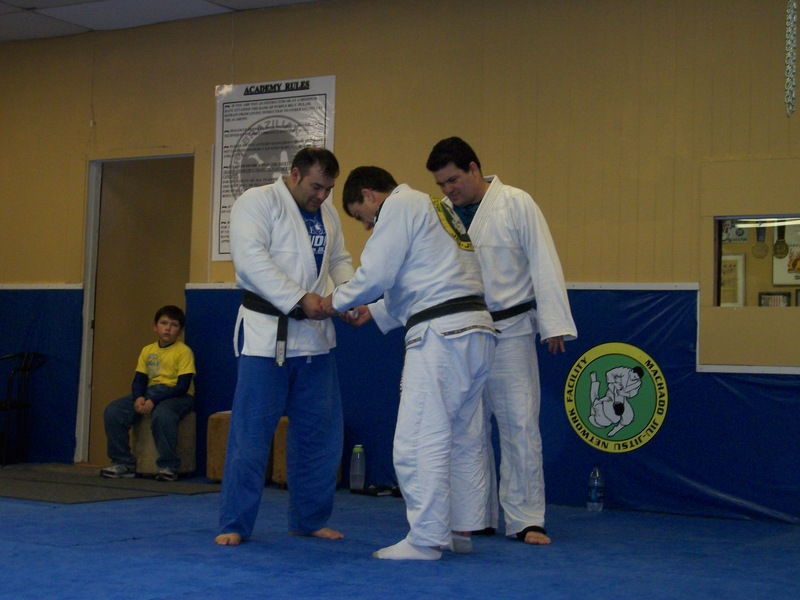 When I received my blue belt, I was one of ten total in Texas. I have been affiliated with Professor Carlos Machado and maintain a personal, business and family relationship with he and his brothers since 1996, and I have been his first and longest running affiliate. I remember when he asked me to be an affiliate, I really thought I was not qualified, and he prompted me to teach a class to help spread the Machado style BJJ in Texas. I remember I would go with Carlos to assist him in seminars at different places, and he took me with him to Las Vegas in 1996 to a Chuck Norris UFAF (United Fighting Arts Federation) convention. I learned so much from assisting him, and how he would teach, mentor and develop new ideas. I was still very, very inexperienced, and when I became a purple belt, I was Carlos’ first in Texas. I noticed that my purple belt awed anyone who trained in my classes. Even Blue belts awe some people training. When I moved to Austin, Texas in 1999, it was the same reaction. To me, this showed that at times belts are misunderstood for what people project them to be. A purple belt has good foundation and intermediate-advanced skills, but a purple belt is still a student. I have Brown belts for example that can wrestle very tough, but detail, teaching, and developing skills to mentor other students still need polishing. I personally never felt that people should regard anyone with an idol worship mentality. I believe when we achieve our Black belts in BJJ, we have a choice of our pathway and destiny. And responsibility. It always starts at the white belt. When we achieve a BJJ Black belt, we not only should have attained knowledge of teaching techniques, good sparring ability and development of ideas, but we should also understand that our conduct is an everyday microscope. If you are a Black belt, and you injure a student intentionally, let’s say you heel hook a new white belt or neck crank him, then in my opinion you have shown nothing but anger and an internal strife you will never overcome. Most of these bullying mentalities are immature, and are not impressive, and most of the time these types never grow out of it. This is different from just wild students. New students have a type of wildness that they cant help. They have to be mentored to develop flow, patience, and general control. I have been given a gift from God to problem solve. In BJJ, I remember training with Master Rigan Machado in 2001 in California to prepare for the Pan Am world championship. He told me: “Sometimes, the best way to learn to become a better Jiu-jitsu practitioner is to get your @$$ kicked.” We all laughed, but it was a serious and very philosophical statement. It has to do with the humility complex. If we never learn humility, if we do not learn our flaws, our naïve morality and holes to our game, then we have yet to learn an unexplored area of our BJJ career. I remember Rigan did a drill with me one time to test my defense in California. It was a drill where he took three of his top guys and started round one with them pinning me on the side mount, round two they started with them mounting me and three mounting my back. It was a great learning curve for me, the intent was for me to escape and come back to fight back when behind in points. To this day sometimes when sparring in my class I take some of my top students and let them start in mount or side mount or back. From there I practice escapes, angles, defense, but more importantly it helps you to work frustrating angles that you need to mentally confront. At times some of my students think I have a bored contempt look when I am playing defense. Some think I am ‘playing around’. I am not. I have explained many times to my students that I am totally aware of a threatening position, how to problem solve what type of submissions I am vulnerable to and how to prevent, avoid or disable. This problem solving technique conquered some mental barriers when I was a white and blue belt on bad positions. When I read Master Machado’s statement, it is true, the luxury is mine. Training, learning and developing almost 15 years of my relationship with Carlos, Roger, Rigan, Jean-Jacques and John Machado, what taught me and keeps educating me in this area is the constant knowledge of teaching and relations with students. This legend was not simply a fighter. Rickson Gracie was and is a philosopher, warrior, martial artist and a man of honor. He tested himself many times, and that issue is important, and opened up the doors for many of us in BJJ. In my opinion, the more we have had people introduced into the martial arts, we get different types, and we have different types of goals as mentioned above. I am a martial artist, and I have been into the martial arts since 6th grade. I was always a fan of Bruce Lee movies, and if I found any martial arts magazine, I would read it, reread it over and over. In the MMA and BJJ industry, it seems that we have a lot to improve upon. At my academy, and my affiliates in Texas, the rule is to respect for each other. I once heard actor and politician Jesse ‘The Body’ Ventura in an interview when he talked about his Pro wrestling days. I remember him saying that in pro wrestling, the safety of his opponent was more of a concern than his own. In all the talk about whether Brock Lesnar’s pro wrestling-style antics at UFC 100 reflected badly on mixed martial arts, no one thought about whether Lesnar’s antics reflected badly on pro wrestling — at least until former Minnesota Governor and WWF star Jesse “The Body” Ventura appeared on Larry King Live. After explaining to King that there’s no such thing as “ultimate boxing,” Ventura said he likes and respects MMA, but he thinks Lesnar crossed the line with his behavior on Saturday night. I myself have always tried to maintain a respectful, safe and educational facility when training BJJ at my academy, and in my teaching career of 14 years. The worst thing is to get a student who tries to head hunt or want to roll with higher belts or just ‘ask to roll’. To me, it is such a disrespectful attitude when people do that. I have a rule that lower beltsmust respect higher belts and never approach them demanding to spar. Higher belts always ask higher and lower belts to train. To have such a poor attitude totally questions the meaning of training not just in BJJ, but everything in life. If Rigan, John, Jean Jacques, Roger or Carlos Machado are teaching a clinic, it would be so disrespectful for anyone to ‘ask them to roll’ or spar. These are men that have competed and won multiple world championships, competed in Judo, Sambo, wrestling and Abu Dhabi world grappling championships. They have nothing to prove to anyone. I think in our fundamental classes, training should be very controlled so the intro student develops comfort, not stress or feel he is in a gunfight each class. In our advanced classes, our upper level belted students train with different partners all the time, work bad positions, new ideas and problem solve while developing their skills. Granted, there are some schools come and go, and not everyone is a great teacher or even a good organizer for teaching, but if someone has attained a brown or black belt, that is the first question. The second question is to research and confirm what they say with whoever they are associated under or have achieved rank with. My associations in Texas all have my endorsement, and all of them maintain training under me to develop new strategies. I have had some people claim to be associated under me in areas of Texas and I would correct that in one day. To develop association or student-instructor relations, you have to cultivate that, you have to develop that and appreciate that. If anyone conflicts with any of my affiliate schools, I definitely will make it clear who is on what side of the line. I have been in this industry for 14 years. I was the first Machado affiliate in Texas, and have been through all the Wild West days, and have seen too much drama that does not pertain to our philosophy. There are so many great things about this industry too, and I hope to champion the cause of education to the public eye in the sense that we are not bullies, or arrogant people that simply challenge others. We should be martial artists first. We should practice the philosophy from the Great Carlos Gracie (Machado brothers uncle and husband to their Aunt Lair). Carlos Gracie did challenge matches. He and his brothers fought in them, but his intent was to prove their style of Jiu-jitsu. I remember when I was a white belt, I listened to my instructor Master Carlos Machado speak about Carlos Gracie. He told me when he and his brothers came to the USA, Carlos Gracie told him to be humble, don’t get into the fighting, arguing or challenging mentality. He told me Carlos Gracie told him they (Carlos Gracie and his brothers) had to do that then to prove the style of BJJ, but they (The Machados) need to teach philosophy and humility. I never forgot that. I always kept that to myself. Anyone can train and learn from the martial arts, but martial arts cannot teach everyone. What I mean by that is even with the information, philosophy and education; it means nothing to some people. In my fourteen years of teaching, I have learned from mistakes, I have had students come and go, but the great ones have been there or still are training under me, or in contact if they live in another state or city. At times temper and attitude can only be tolerated so far, and we as instructors have a duty and responsibility to deflect these personality problems in our academies. I have expelled five total students in my fourteen years. Usually if there are problems with a student, a private discussion is needed, mentoring, guidance communication and so on ensues. At times, unfortunately none of this works. And unfortunately, students like that are detrimental to your academy. Since I started in October 1995, I have seen Texas and the USA grow in BJJ and many come and go in this industry. I have seen very well intended people train for a very long time. I have also seen anything from those seeking a worship club to those 40-year-old adolescents trying to start a new career. I have seen posts on forums where people are looking to hire instructors to teach at a location they lease. If you are a certified trainer or promoter, that may be justified. When people simply attempt to seize an opportunity, they are normally an organization with the wrong intent. I have seen posts of people asking advice on how to start a BJJ or MMA school, or even wanting to be an MMA promoter. When I started teaching, its ironic. I never thought of this as a way for me to ‘make a living’, ‘make a career’ or anything to do with finances. Of course I teach full time and this is my living I make now, but when I first was approached by my instructor Carlos Machado to open an association, I didn’t think I was qualified. I didn’t feel I should even teach. I thought you should have only been a Black belt. And I will always remember like it was yesterday what Carlos Machado told me. Funny, to this day I never thought of how much money I wanted to make, or what fame and fortune I would achieve by using the art, not by expanding its philosophy. I never started mentally counting how much I would make off how many students, and such. This is first and foremost the wrong idea of this and all business industries. Anyone can desire to be a BMW dealer, but you better know how he or she works first. One thing I learned at an early age in life is work ethic. Some people will never understand what that means. I bagged groceries when I was 13, did lawns as a teenager, and when I graduated from high school, I did mop and tar roofing and bounced in a nightclub at night while juggling my first year of college. The second year I walked on to another college in Kansas for a partial football scholarship to pay for my school. Those were good goals of desire in those days, but I had and still have desire, I had and still have motivation. I note that the motivation was not ‘money’; it was accomplishing a better life, and a profession, and making a difference hopefully for the better for others. I went from working real estate in the daytime and working in nightclubs at night to eventually investing in Real estate and owning a nightclub and a BJJ academy. I also learned that when you achieve success, you should give back a little to your community to help others. I understand the concept of hard work. I understand the concept of goal setting. And along the way there are trips and stumbling. I had a terrible head trauma years ago that set me back and threatened my life. I know what its like to start over. I know what its like to appreciate value in life. Even small things. I have had many students of mine tell me they were solicited or offered discounts, free training, etc., to go somewhere else but chose not to. I don’t really care to practice that type of solicitation at all. I usually receive about every month or two students from other martial arts schools in my area. I noticed that when people ask to join my class, I usually tell them to talk to their instructor first, and if they want to train with me then make it clear to them. I personally see nothing flattering about students that break off other schools to come to mine. Those usually keep doing that no matter where they go. I never believed in the flying two flags philosophy. Many of these types of students simply wanted to train at two places to get different mat time with different people. No thanks. I have some of the absolute best students I could ever have asked for, and more importantly, they are loyal, well studied and help each other to grow in all directions. This is what I teach. This is what I have learned in my 14 years. I earn my own bones in life, and I have told my affiliate schools (Buda, Luling, Seguin, Brownsville, Harlingen and Weslaco) the same thing, and they all practice this philosophy. They are wonderful Diplomats to our art and more importantly the philosophies bestowed upon me via my instructors that were given to them. Master Rigan Machado talked a lot about different issues involving philosophy, teaching, student-instructor relations and their importance, and other things. Rigan told me a very good point on teaching and the issues of students, in the BJJ business. Rigan stated that students come, students go, money comes, money goes, but your true friends and family you always have to keep them close, always. Wow. Just like that. What a guy. Simple answer. That’s Rigan Machado. My thanks to you Rigan, and to Carlos Machado for a fantastic weekend!! 2009 is a great year, and our attendance, loyal students, recent Black belts, and visits from Carlos and Rigan Machado capped a great learning, growing and developing of a great community!!!! Awesome year!! Merry Christmas and New years to all! I look forward to 2010!